Yamaguchi N, Okui A, Yamada T, Nakazato H, Mitsui S.
Spinesin/TMPRSS5, a novel transmembrane serine protease, cloned from human spinal cord. J Biol Chem. 2002 Mar 1;277(9):6806-12. TMPRSS5 polyclonal antibody ( Cat # PAB6124 ) staining ( 0.5 µg/ml ) of human brain ( Cerebral Cortex) lysate ( RIPA buffer, 35 µg total protein per lane ) . Primary incubated for 1 hour. Detected by western blot using chemiluminescence. 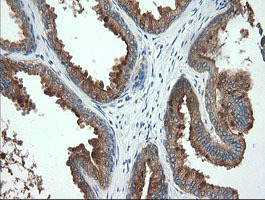 TMPRSS5 monoclonal antibody (M09), clone 2E5. Western Blot analysis of TMPRSS5 expression in human kidney. 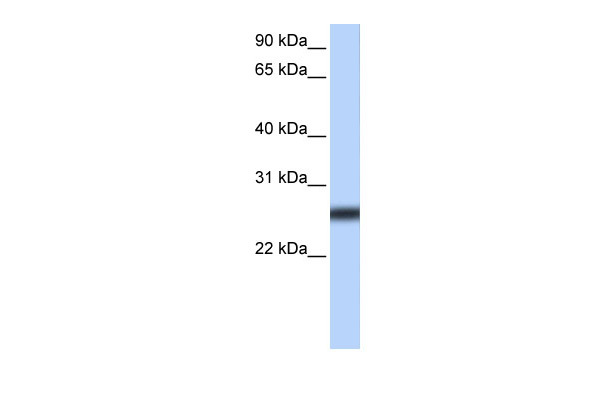 Western Blot analysis of TMPRSS5 expression in transfected 293T cell line (H00080975-T01) by TMPRSS5 MaxPab polyclonal antibody.Lane 1: TMPRSS5 transfected lysate(50.27 KDa).Lane 2: Non-transfected lysate. TMPRSS5 Antibody (N-term) (AP54301PU-N) western blot analysis in NCI-H292 cell line lysates (35 µg/lane). 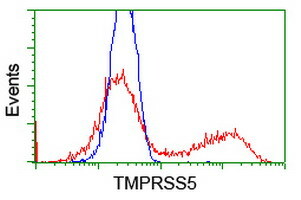 This demonstrates the TMPRSS5 antibody detected the TMPRSS5 protein (arrow). Anti-TMPRSS5 mouse monoclonal antibody (TA503409) immunofluorescent staining of COS7 cells transiently transfected by pCMV6-ENTRY TMPRSS5(RC223774). HEK293T cells were transfected with the pCMV6-ENTRY control (Left lane) or pCMV6-ENTRY TMPRSS5 (RC223774, Right lane) cDNA for 48 hrs and lysed. Equivalent amounts of cell lysates (5 ug per lane) were separated by SDS-PAGE and immunoblotted with anti-TMPRSS5. 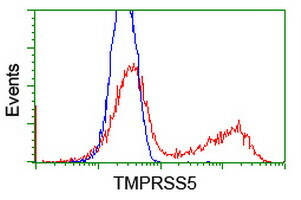 HEK293T cells transfected with either RC223774 overexpress plasmid(Red) or empty vector control plasmid(Blue) were immunostained by anti-TMPRSS5 antibody(TA503409), and then analyzed by flow cytometry. 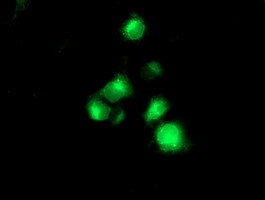 Anti-TMPRSS5 mouse monoclonal antibody (TA503427) immunofluorescent staining of COS7 cells transiently transfected by pCMV6-ENTRY TMPRSS5(RC223774). 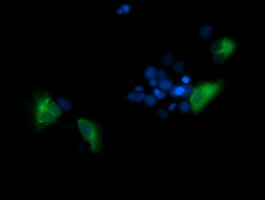 HEK293T cells transfected with either RC223774 overexpress plasmid(Red) or empty vector control plasmid(Blue) were immunostained by anti-TMPRSS5 antibody(TA503427), and then analyzed by flow cytometry. 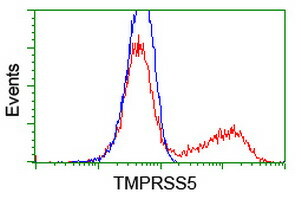 HEK293T cells transfected with either RC223774 overexpress plasmid(Red) or empty vector control plasmid(Blue) were immunostained by anti-TMPRSS5 antibody(TA503429), and then analyzed by flow cytometry. Anti-TMPRSS5 mouse monoclonal antibody (TA503433) immunofluorescent staining of COS7 cells transiently transfected by pCMV6-ENTRY TMPRSS5(RC223774). 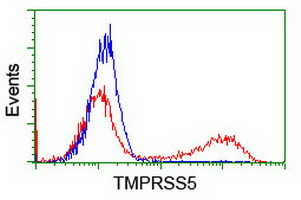 HEK293T cells transfected with either RC223774 overexpress plasmid(Red) or empty vector control plasmid(Blue) were immunostained by anti-TMPRSS5 antibody(TA503433), and then analyzed by flow cytometry. 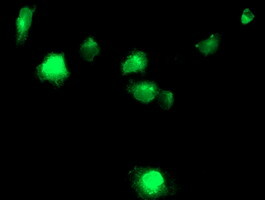 Anti-TMPRSS5 mouse monoclonal antibody (TA504339) immunofluorescent staining of COS7 cells transiently transfected by pCMV6-ENTRY TMPRSS5(RC223774). TA302769 staining (0.5µg/ml) of Human Brain (Cerebral Cortex) lysate (RIPA buffer, 35µg total protein per lane). Primary incubated for 1 hour. Detected by western blot using chemiluminescence.